Mystery Objects "Petra's Great Temple"
Think you know what this is? Click on the object to learn its identity. We have a series of mysteries on our hands. 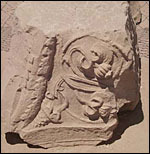 Two different elements in stone carvings pose a question. What exactly do they represent? Many capitals feature this design, either a pine cone boss or a section of grapes. Which is it? The other, depicted on the architrave, could either be a pomegranate or a poppy flower. What do you think?